As I mentioned in my last post, I’ve been discussing the origins of the NHS with a presumably Tory critic, who took issue with my statement that Nye Bevan is the NHS’ founder. Among his other points, he argues that Winston Churchill was in favour of it, and the NHS would have happened regardless of who was in government at the time. I have argued that Churchill was in fact highly ambivalent about it. Sometimes he was for it, at other times against. G.C. Peden, in his British Economic and Social Policy: Lloyd George to Margaret Thatcher (Oxford: Philip Allan Publishers Limited 1985) has this to say about the public and the government’s response to the report. The focus for discussion of postwar social planning was the Beveridge Report on Social Insurance and Allied Services (Cmd. 6404). The Report appeared in December 1942, at a time when ultimate victory could be foreseen and when new incentives had to be found to maintain the war effort. Despite this, the Government was cautious, if not openly hostile, to Beveridge’s proposals for universal social insurance, without means test, against interruption of earning due to unemployment, ill health or old age. It was true that the Anglo-American peace aims in the ‘Atlantic Charter’ of 1941 had included a reference to ‘social security’ but Churchill thought that such plans should be substantially left until after the War. As Harris (1977) has shown, the Beveridge Report had been very much Sir William Beveridge’s own handiwork. His committee had been expected to deal with technical questions related to workmen’s compensation for industrial disease or injury, and with anomalies in social insurance, such as the well-known one whereby a man whose earning were interrupted because of unemployment received a higher rate of benefit than if he were sick. Beveridge, however, had gone beyond his terms of reference and had called for an attack on Disease, Ignorance, Squalor and Idleness as well as Want – the five giants on the road of reconstruction, as he called them in Bunyanesque language. In particular, he stated that no satisfactory scheme of social security could be devised unless there were family allowances, comprehensive health and rehabilitation services, and avoidance of mass unemployment. Indeed, the actuarial soundness of Beveridge’s plan depended upon the average rate of unemployment being no higher than the lowest level in the 1930s; that is 10 per cent of interwar insured labour force or 8.5 per cent of the wider body of insured employees in the new scheme (Cmd 6404, pp. 120, 154-65, 185-6). Uncertainty whether unemployment could be controlled, and memories of the political consequences of an actuarially unsound unemployment insurance fund in 1931, no doubt contributed to the Treasury’s critical reception of the Report. Nevertheless there can be little doubt that the Report was extremely popular with the general public and, following a backbench revolt in parliament, the Government felt compelled to commit itself to Beveridge’s plan, at least in principle. Widespread support for universal social insurance without means test may have been the result of what Titmuss called a ‘war-warmed impulse of people for a more generous society’. On the other hand, the fact that so many people in the armed forces and munitions industries could not but be uncertain about their own post-war employment, in the light of post-1918 experience, must have been a factor. In the interwar years the unemployed had always been a minority of the electorate; in the war those who felt threatened by unemployment may well have been a majority. Moreover, the associated prospect of universal health insurance may well have been attractive to people had been finding the cost of private health insurance a burden. The National Health Service Act of 1946, and its implementation on the Appointed Day in 1948, was a considerable achievement of Aneurin Bevan, the Minister of Health. Bevan’s original nation health proposals differed from those of Willink, his Conservative predecessor, chiefly in respect of the degree of the Ministry’s control over hospitals and doctors, and in the emphasis given to group partnerships of doctors in local health centres. Whereas Willink had wished to preserve the independence of voluntary hospitals, Bevan took over all local authority and voluntary hospitals, except those not necessary for the National Health Service (NHS). Bevan’s biggest problem was with the British Medical Association which, as late as February 1948, organised a poll of its members which resulted in a vote of 8:1 against the Act. Bevan was aware of the need to meet the medical profession on some points. In particular, he was willing to allow private beds in NHS hospitals so as to attract the best specialists into the service. He met the general practitioners’ fears for their independence by promising that there would be no wholetime salaried medical service. In the end the doctors and consultants were given a larger place in the administration of the NHS than Willink had envisaged. (pp. 155-5). Thus, while the Tories did have a role in the creation of the NHS, the government as a whole only reluctantly accepted its necessity after it won a general acceptance amongst the electorate and parliament. Yes, Willink did play his part, but the ultimate creation of the NHS was under Nye Bevan. There is much, much more I could write on this, but at the moment this ends the discussion. I found this very pertinent piece from former US president, Jimmy Carter, in the collection of pieces by Hunter S. Thompson, The Great Shark Hunt (London: Picador 1980). It’s in Carter’s 1974 Law Day address to the students at Georgia University. We had an ethics bill in the state legislature this year. Half of it passed – to require an accounting for contributions during a campaign – but the part that applied to people after the campaign failed. We couldn’t get through a requirement for revelation of payments or gifts to office-holders after they are in office. The largest force against that ethics bill was the lawyers. Some of you here tried to help get a consumer protection package passed without success. The regulatory agencies in Washington are made up, not of people to regulate industries, but of representatives of the industries that are regulated. Is that fair and right and equitable? I don’t think so. I’m only going to serve four years as governor, as you know. I think that’s enough. I enjoy it, but I think I’ve done all I can in the Governor’s office. I see the lobbyists in the State Capitol filling the halls on occasions. Good people, competent people, the most pleasant, personable, extroverted citizens of Georgia. those are the characteristics that are required for a lobbyist. They represent good folks. But I tell you that when a lobbyist goes to represent the Peanut Warehouseman’s Association of the Southeast, which I belong to, which I helped organise, they go there to represent the peanut warehouseman. They don’t go there to represent the customers of the peanut warehouseman. When the State Chamber of Commerce lobbyists go there, they go there to represent the businessmen of Georgia. They don’t go there to represent the customers of the businessmen of Georgia. When your own organisation is interested in some legislation there in the Capitol, they’re interested in the welfare or prerogatives or authority of the lawyers. They are not there to represent in any sort of exclusive way the client of the lawyers. The American Medical Association and its Georgia equivalent – they represent the doctors, who are fine people. But they certainly don’t represent the patients of a doctor. Obviously, there are some differences between the situation Carter and Thompson describe. I think we do have legislation in this country, which requires gifts to ministers and civil servants to be declared. And some of the most determined opposition to the Tories’ campaign to privatise the NHS has come from the ranks of the British Medical Association. But the substance of what Carter said is as true today as it was when Carter said it. If you read Private Eye in the 1990s, you saw fortnight after fortnight yet more news of someone from one of the industries getting a job in the body that was set up to regulate it. And it’s gone on. Private Eye are still running stories about banks and the leading accountancy firms, who were most notorious at dodging tax sending senior staff to act as interns or advisors to the Inland Revenue and the financial regulatory authorities. Or else a former managing director or chairman of the board from one these industries him- or herself gets a place there. As for the lobbyists, Mike over at Vox Political the other year ran many pieces describing the Tory act that was supposed to limit their influence. Except it didn’t. What it did instead was try to cut out the influence of smaller, grass roots activist groups campaigning against some injustice or piece of misgovernment, and try to limit the ability of trade unions to campaign against particular issues. The lobbyists themselves were left largely untouched. As you can expect from a government, whose annual conferences are paid for by the big corporations, and which is headed by a PR spin merchant: David Cameron himself. Carter was right to attack the corruption of the regulatory bodies by the very corporations they were meant to be overseeing, and his remarks on the pernicious influence of the lobbyists is still very timely. It’s time to clean up politics, and get rid of them and the Tories. Thank you for highlighting this issue. I am the creator and apparent antagonist by posting this and another related post on the so called ‘Labour Forum’. I was angered by their actions and told them so (without swearing) – I asked for them to be reinstated, but I was threatened with a ban – So I told the jumped-up, swaggering b*****d just what I thought about him and his tin-pot political correctness, knowing full well I would be banned. I was extremely angry with them for initially removing the posts and angered more by the explanation which was not only inaccurate but extremely patronising. I am not anti-labour, but it does appear to be anti-working class… It is time it realised the people didn’t leave them, they left us…. disengaged chatterers…. and out of touch with the passion people have for the injustices against so many people who have witnessed a blitzkrieg attack upon their NHS and their Social Security system with so many, too many so called labour MPs standing by whilst others cash in on their financial interest in the Private Health sector…. Thanks again – Injustice Anywhere is a Threat to Justice Everywhere. I feel they should apologise for removing the posts – I don’t expect or wish for a personal apology not after sharing a small section of my anger and disgust with their outrageous tactics. Adrian Wait. The Labour Forum’s censorship is wrong and completely ahistorical. Mike has already pointed out in his article that the Beveridge Report setting up the NHS was in response to concerns about the victories of the German army at the start of the War, which drove us out of France and back to Britain. The Germans were better nourished and healthier, with the support of old age pensions, unemployment and sickness insurance brought in by Bismarck in the 1870s. When the Liberals first introduced these measures shortly before the First World War, the Germans boasted that the Reich had already had them for over forty years. Titumuss argued that the hazards of war were universal and that prewar principles of selectivity could no longer be applied. Bomb victims could not be treated like recipients of poor relief. The Unemployment Assistance Board, which became simply the Assistance Board, was used to pay out hardship allowances, rather than leave these to local Public Assistance Committees, which were associated in the public mind with the Poor Law. When inflation reduced the value of old age pensions, the Assistance Board was empowered to pay supplementary pensions based on need, and by 1941 the Board was dealing with ten times as many pensioners as unemployed men. As Minister of Labour, Bevin insisted on abolishing the household means test, and the Determination of Needs Act of 1941 substituted an assumed contribution from non-dependent members of a family. Titmuss stressed cross-party support for welfare policies. According to him (pp. 506-17), the condition of inner city children evacuated to more prosperous areas shocked public opinion and moved the Government to take ‘positive steps’. Cheap or free school meals and milk were made available to all children and not, as hitherto, only to the ‘necessitous’. Free milk, orange juice and cod liver oil were provided for all expectant mothers and for children under five years. In all these ways, Titmuss argued, the ‘war-warmed impulse of people for a more generous society’ created favourable conditions for planning ‘social reconstruction’ after the war. (pp. 135-6). Titmuss’ view has now been criticised, as Titmuss was excluded studying plans for post-War policy, and so his view did not necessarily correspond to the government’s actual intentions. Peden notes that the outbreak of the War halted slum clearance, house building, and may have delayed the extension of national insurance to workers’ families and dependence and the introduction of family allowances. The Tories own Research Department had been worried about their own chances of winning elections before the War, and so had suggested including the above measures in their manifesto. On the other hand, the TUC had opposed Family Allowances, as they feared this would allow employers to pay low wages, and there was little support for them from the government. (p. 135). For all its reservations on Beveridge’s main proposals, the Government did agree in principle with his assumption that there should be a comprehensive health service available to all, without any conditions of insurance contributions. The trouble was that it proved to be impossible during the war for the details of such a service to be agreed, either between political parties or with the interest groups involved. Certainly was had increased the state’s role. Greatly exaggerated prewar estimates of numbers of casualties in air raids had led to the provision of 80,000 Emergency Hospital beds, compared with 78,000 beds in voluntary hospitals and 320,000 in local authority hospitals. Moreover, the Emergency Hospital Service gradually extended its operations from war causaulties to treatment of sick people transferred from inner city hospitals and then to other evacuees. In discussions in 1943-45 on a future national health service, however, both Conservative ministers and the British Medical Association showed themselves to be determined to safeguard private practice and the independence of the voluntary hospitals. In particular, there were deep differences between successive Conservative ministers of health, Ernest Brown and Henry Willink, who were responsible for health service in England and Wales, and the Labour Secretary of State for Scotland, Tom Johnston, who was responsible for health services north of the border. For example, Johnston successfully opposed the idea of maintenance charges for patients in hospital. The 1944 White Paper on A National Health Service (CMd 6502), which was signed by Willink and Johnston, left much undecided and was avowedly only a consultative document. Peden then goes on to state that there is little evidence that the War created a lasting consensus in favour of the Welfare State. He does, however, agree that the experience of the war created a more universalist approach to social problems, and that it led to the main political parties meeting on a ‘Butskellite’ centre. (pp. 142-3). He considers instead that the solutions recommended by the Wartime government were merely attempts to deal with temporary insecurity caused by the War. Nevertheless, the War had led to the demand for the creation of the NHS, and the massive expansion in state hospital provision. 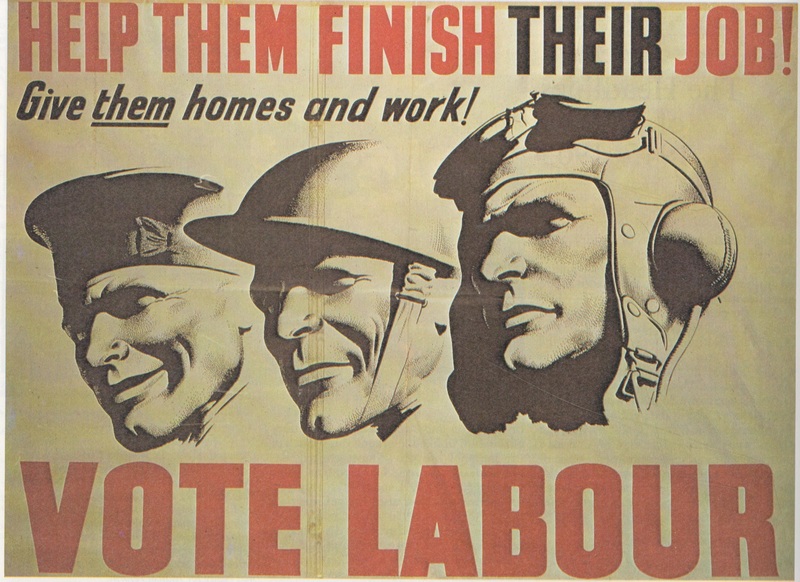 And the Labour party played on the desire to create a better society for the servicemen and women, who had fought so hard against Fascism and the Nazi menace, as shown in the poster below. 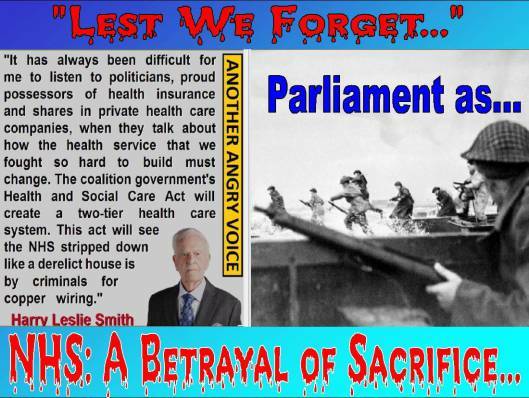 The Tories too, have had absolutely no qualms about using images from WW2 in their election propaganda. I can remember their 1987 election broadcast being awash with images of dog-fighting Spitfires, ending with an excited voice exclaiming ‘It’s great to be great again’. All while Thatcher was doing her level best to destroy real wages and smash Britain as a manufacturing nation in the interests of the financial sector. The satirist Alan Coren drily remarked that the broadcast showed that the War was won by ‘the Royal Conservative Airforce’, and stated that it was highly ironic that in reality all the servicemen went off and voted Labour. All this seems to have been lost on Labour Forum, which suggests that the mods in charge actually don’t know much about Socialism or the creation of the NHS. You could even wonder if they were actually Labour at all. If they were, then it certainly looks like a Blairite group, afraid that linking D-Day and the origins of the NHS will disrupt its part privatisation introduced by Blair. Many of the firms involved in this were American, and there is certainly massive hostility to any inclusion of the NHS as one of the great achievements of British history by the transatlantic extreme Right. They were fuming, for example, at Danny Boyle’s inclusion of the NHS in the historical tableaux at the opening ceremony of the 2012 Olympics. The censors over at Labour Forum seem to reflect this mentality, rather than anything genuinely and historically Labour. It’s time the Right-wing censors over at Labour Forum were finally shown the door, and a proper historical perspective and pride taken in the NHS, one of the great legacies left by the people, who fought so bravely to keep Europe free.